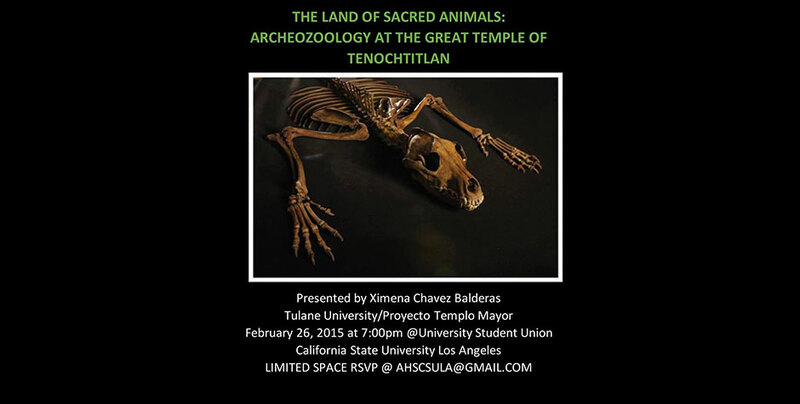 The AHS (Art History Society at CSULA) is excited for the opportunity to host Ximena Chávez Balderas of Tulane University / Proyecto Templo Mayor for this special presentation on February 26, 2015 at 7:00 pm at California State University, Los Angeles. Since 1978, the Templo Mayor Project has discovered a series of biological treasures with no precedent in Mesoamerica. The remains of thousands of organisms –sponges, echinoderms, corals, mollusks, arthropods, fish, amphibians, reptiles, birds and mammals– have been found in 165 offerings within the archaeological site. These animals were obtained both from distant regions and near Tenochtitlan. Some of them were collected, others were hunted, and the rest were bred in captivity, all of them with one objective: to be used in rituals at the sacred precinct. The lives of these animals were dedicated to the gods and for the consecration of the Templo Mayor. In addition, they were used as raw material for manufacturing elite ritual goods. This presentation will address the extraordinary biological diversity found in the ritual deposits of the Great Temple, as well as the history of archaeological findings at the site. Recent discoveries found in the last five years will be discuss as well as how they contribute to the understanding of captivity, animal sacrifice, post-sacrificial treatments and ritual use. This event has limited space, please RSVP to ahscsula@gmail.com to guarantee seating. Additional details can be found at the AHS Facebook page.